Meet the Beatles for Real: I met a Beatle...for Real!!!!!! I met a Beatle...for Real!!!!!! Copyright belongs to Sara and Coral Schmidt. Do not use the photo without permission. I met a Beatle...for Real!!! Dreams can come true. I always knew that I would someday meet one of the Beatles and I ever gave up hope. It always annoyed me that I ran a blog about people that met one of the Beatles in person and I never had a story myself (well except when Paul read my sign in Memphis in 2013 -- that was pretty amazing). 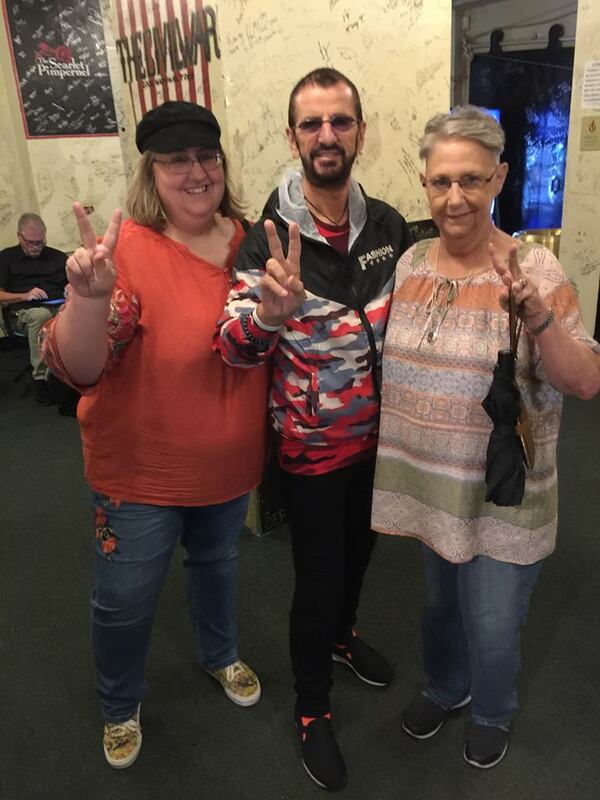 How my mom and I got to meet Ringo Starr is all about money and luck. Here is a short version of how it came to happen. Several months ago I saw posted on the facebook page for Ringo's art stating that you can meet Ringo during his next tour. Since I already had tickets to see Ringo in St. Louis, I contacted the site and was told that I would get an email with details in early September. Meanwhile, I went to the Fest in Chicago and talked to the someone at Ringo's art room there and learned that the meet and greets only take place in certain cities on the tour and that St. Louis was not on the list of meet and greet cities, but sometimes exceptions can be made, but it is rare. It costs money to do a meet and greet with Ringo. It isn't a free thing, which I know I have written about before. The deal is that you buy a piece of Ringo's artwork that is autographed by Ringo and you get to meet him backstage for a few minutes and get photos taken. You get one piece of artwork and two people can meet him. I got the email and sure enough St. Louis was not one of the two cities on the list. Only eight groups of people would be able to meet Ringo on this tour and with St. Louis not on the list, it wasn't likely my mom and I were going to get to do it, but I emailed and asked if an exception could be made just in case. 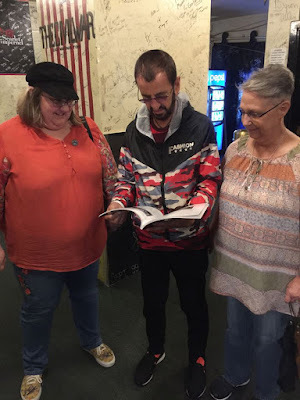 Long story short, Ringo had to be asked more than once if it would be okay to meet some major fans in St. Louis and he usually just likes to stick with the planned cities, but for some reason, he agreed to meet us! The concert was on Friday and on Thursday, I still wasn't totally sure if it was going to happen, so I kept it a secret (although if you look back on my Thursday post of the young Ringo I said I was "spending some time with Ringo" which was a mini clue). That was HOW it happened, but now let's talk about WHAT happened. My mom and I were told to stand in the line to get into the theater. So we got in a very long line that was wrapping around the Fox Theater and stood there, expecting to go in and have our tickets scanned, meet up with the person we were to meet and then wait another half hour or so to meet Ringo. While in line I get a phone call saying to get to the door that has a lady in a Paul McCartney t-shirt standing out front and have the guard let us in because Ringo was ready for us right now, so we better hurry! So we practically run to the front of the line and low and behold there are several ladies wearing Paul McCartney t-shirts standing outside the different doors. I start looking inside and the guard is telling me I have to get in line and wait. I try to explain through the glass that I was told I was going to be let in. I am sure he thought "yeah right lady...whatever" but then I saw the man that was going to take us backstage and he vouched for me. Thank goodness! We are rushed through the bag check and ticket scan and before I could even comprehend what was going on, we were rushed through the theater and to the backstage area. I think I can speak for my mom on this -- we were standing backstage and we were so nervous. I felt like my heart was beating out of my chest. Was this really going to happen? I started to worry about how we would act -- would my mom faint? Would I cry? What if I have bad breath from the salad I just ate? The Ringo appeared from behind a door and my nerves were a lot less. He was so friendly. He said, "I am here to meet you!" First, he gave my mom a hug. She said "Oh I guess I have to let go" and we all laughed. Mom had dreamed of hugging Ringo since 1964 and told him how she had been a fan of his since she saw him on the Ed Sullivan Show. Ringo said, "Oh that can't be -- how old were you then, 6?" Again we all laughed. Then he hugged me. Ringo felt so small, although he was taller than I thought. I couldn't believe that Ringo Starr gave me a hug. Then I gave Ringo a copy of my book. I told him that it was a book a wrote about the Beatles in St. Louis and it talks about all the concerts he has given here as a solo artist as well. He happily took the book from me and flipped through it. He saw the photo of his drum kit that I took at the Rock n Roll Hall of fame and said, "there's my old kit." Then he flipped to a photo of The Beatles playing at Busch Stadium in 1966 and stated, "There I am with the lads." He really seemed happy. He put my book inside a trash can. He must have noticed the strange look on my face because he said, "Oh--there is just towel in there." I was nervous about giving the book to him. I didn't want to seem too crazy of a fan, but now I am glad that I did it. I mean how many Beatles authors can say that one of the Beatles looked at their book in front of them? Even if Ringo let it behind in St. Louis, at least he flipped through it! Copyright by Sara & Coral Schmidt DO NOT USE THIS PHOTO! After that, we got our photographs taken with Ringo. He told us "peace and love" and we said, "Peace and love Ringo." I told him that we are looking forward to the show tonight and he said something like "enjoy it" and gave us another "peace and love" and left. We were then rushed out of the backstage area and out into the lobby where we saw our friends and were freaking out that it all really happened. We showed them our photographs and gave them both a hug so that they could be the next people we hugged after hugging Ringo. It happened fast but yet it was so memorable and is the new highlight of my life. Lastly, I want to say that I wish each of you were there and could have met Ringo too. He was so nice to agree to meet up and was just so nice to us. You read that Ringo isn't very nice and all sorts of stuff about his personality, but for the five minutes or so we spent with him -- he couldn't have been nicer. I think he really loves his fans, but gets tired of the fame. I will review the concert on Wednesday and share my concert photos then. If you have any questions feel free to ask, although I don't really want to talk any more about how I got to meet him. I would rather focus on meeting him, because that is a much more exciting thing to talk about. SARAH I'M SO HAPPY FOR YOU AND YOUR MOM, WISH I COULD SEE YOU BOTH THIS WEEKEND, BUT I CAN'T GO THIS YEAR, LOVED YOUR BLOG AND GREAT PICS! So happy for you both!!! I'm so very happy for y'all......so glad this happened to two amazing ladies.....glad I got to have Ringo by proxy with that hug.....amazing show and amazing night!!!!! Very cool for you and your mom, Sara! AND since I got to sit next to you at Beatlefest I'm only a couple degrees away! Glad you got to fufill a dream! Quite cool (and rare) to actually meet Ringo. It's very cool to see one of your idols going through your book. Very proud of your site,and all your hard work on maintaining a blog with interesting photos and info! Hopefully I will go through your book. Very happy for you indeed! Félicitations (en français) and thanks for this great and nice description of someone who meet the Beatles for real...YOU!!! So pleased for you - you absolutely deserve it! Sara - brilliant experience for you & your Mum! This was the best Beatle meeting that I have read (or heard) in quite some time. Great story - I'm so happy for both of you! Good for you. I'm part of the fans that have never met one of The Beatles, but I have a funny story. A few years ago we had a German exchange student living with us in California. Paul's "Kisses on the Bottom" had just come out and I was playing it in the car for my kids and our German guest. He asked who was playing, and I told him it was Paul McCartney. He asked, "Was he in The Beatles? I've met him." Our young German friend had a genuine normal conversation with Paul without all the fan anxiety I would have had. Just two people waiting for the kids to finish playing at the playground, chatting it up. I was, and still am, so jealous. WOW!!!!!!!!!! SARA I AM SO HAPPY FOR YOU!!!!!!!!!!!! Ok ok, let me get my composure! First: you and Mom (and Ringo) look VERY cool!!!! I love that he's flipping through your book, and he looks like he's really checking it out!!!! The garbage can thing is HILARIOUS....and very "Ringo"!!!! I think Ringo is the only person in the world who could get away with taking a book you worked hard to write....and putting it directly into a garbage pail right in front of you! "There's me old kit!" hahahahaha. I love that you write about all of his solo shows in St. Louis, and I'll bet YOU are also!!!! Interesting that he was taller than you expected!!!! I have to look at those two photos again, hold on. I have to say it again: you and Mom look WAY cool in those pics! Mom looks YOUNG! She doesn't look like she's old enough to have seen the Beatles on Ed Sullivan! She looks like she's his GIRLFRIEND, not a giddy fan!!!! Look at her face! I can see the girl from the 1960s in it, if that makes sense, her eyes are no-nonsense. She has that look that says "He's mine." :D If only her friends and classmates from back then could see her now!!!! The both of you look like you've got your composure completely, I can't believe it. I'd be a complete wreck, and I'm a GUY! (whatever THAT means! lol). You look like a seasoned pro meeting a Beatle, like you're a journalist who's interviewed ten thousand celebrities before. I also love your very cool and beautiful jeans, the red blouse and the John cap! Gotta representing John! Ha, I was wondering why you hadn't done anything about Paul's Grand Central Station show (where he brought up two adorable fans that I'd love to know more about! ), or the Jimmy Fallon show, where they played a hilarious prank involving elevators of unsuspecting people( https://www.youtube.com/watch?v=Z9q3e5wIrDw ) Now I know why: you were immersed in Ringomania! Who cares about Paul in Grand Central Station when you've got Ringo in St. Louis....next to you!!!! Hope it didn't set you back TOO much in your bank account, but it looks more than worth it, whatever the price. I did however just think of a funny joke you could have told Ringo: when you gave him the book, you should have asked him if he wanted you to autograph it! LOL!!!! "would you like me to sign it, Ringo?" LOL. I'm cackling right now. Ok ok. Well......all those blogposts where you go out of your way to say you have NOT ever met a Beatle for real are now officially obsolete! Huzzah!!!!!!!!!!!!! Congratulations to you, good friend! And congratulations to Mom! It's been a long time coming for the both of you and I for one am grinning like a pumpkin about it! VERY happy for you both. Long Live Richy!!!!! I'm very very happy for you sara, congrats from the Deep of my heart. was so glad for you when I read this - Ringo!! !